In the United States, different kinds of laws are passed at federal, state, and local levels. 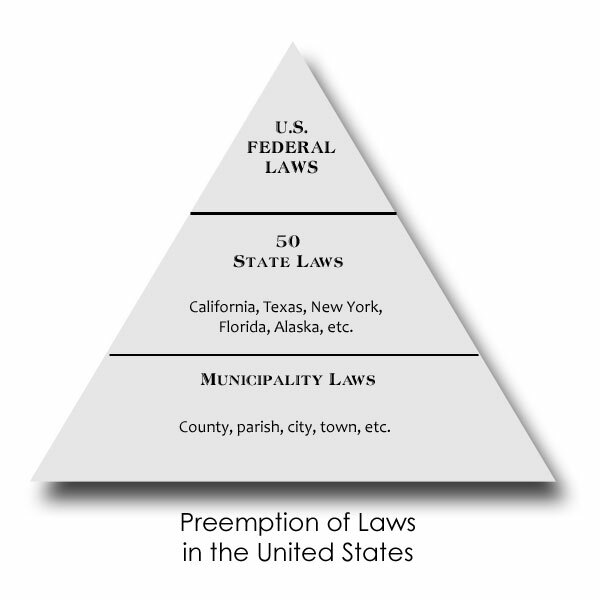 Preemption is the doctrine by which federal laws are designated supreme over state and local laws. The federal government is responsible for some types of laws, such as those pertaining to national defense, currency, interstate commerce, patents, and so forth. State and local governments may not pass these kinds of laws, nor may they pass laws that conflict with federal laws. The state governments may pass laws that are not explicitly reserved by the federal government. State laws affect the citizens and property in that state only. State laws may not conflict with federal laws. Local governments, also called municipalities, include counties, parishes, cities, towns, and so on. Local governments may pass laws that are not reserved by the federal government or the state. Local laws affect the citizens and property in that municipality only. Generally, local laws may not conflict with state law, but there are some exceptions (see Home Rule section below). Municipalities’ laws do not usually apply to other municipalities, even if one municipality is located inside another. Cities and towns are located inside counties and parishes, but they do not have to follow county or parish law. Cities and towns may pass their own laws, which are valid inside city or town limits. County and parish laws usually apply only to unincorporated areas of that county or parish. However, small cities and towns may not have the resources to enforce their own laws; in this case, the town may adopt county laws and rely on the county to enforce those laws. Home rule cities are allowed to pass laws that are inconsistent with state law. However, “home rule” does NOT mean the same thing in every state. The criteria for establishing home rule differs from state to state. The types of laws that home rule cities may pass are also different in different states. Dog control laws are not reserved by the U.S. federal government. Dog control laws are passed and enforced at the state and local level. BSL is unlikely to be proposed at a federal level. States may create statewide dog control laws. This may include laws that prohibit municipalities from passing BSL, or laws that mandate statewide BSL. BSL (or prohibition of BSL) can be proposed by one or more state legislators (e.g. state senators, state representatives) during any given legislative session. A newly introduced proposal is called a bill. This bill usually must work its way through committee hearings and votes in both state houses (usually called a House of Representatives and a Senate, though some states use different terminology) before it can become a law. Most such bills die during early stages. Only a few have survived and become law. Bills that are introduced at the state level usually apply to the entire state. The state laws pertaining to breed-specific legislation are provided on the State Laws page. An overview is provided here. One state, California, prohibits breed-specific laws, but permits breed-specific spay/neuter. One state, Ohio, currently has a statewide breed-specific law. This law was repealed in 2012. Except as stipulated by state dog control laws, municipalities are generally free to pass and enforce dog control laws. Breed-specific laws may also be passed and enforced except where prohibited by state law. In the U.S., dozens of local governments have restricted or prohibited the ownership of certain breeds and types of dogs. A breed-specific law may be introduced by a citizen of the municipality, or it may be introduced by a member of a municipal lawmaking body (e.g. city councilmember or county commissioner). Typically, the lawmaking body holds at least one public hearing, and reads the proposed law on up to three different dates, before holding a vote to determine whether to pass the law. If passed, the law is applied to individuals inside the municipality’s legal limits. Local breed-specific laws generally apply to residents of the municipality, but the language of the law may hold visitors to a different set of expectations. If you are bringing your dog into a municipality that has BSL, even if you are just passing through, it is wise to understand how or whether the local law would apply to you and your dog. Local laws change frequently. If you and your dog intend to move to, visit, or drive through areas where BSL is a possibility, it is best to check with local authorities to find out whether there is BSL, and if so, what the law requires. Call the local animal control authorities or city/county clerks along your travel route and ask them whether their jurisdiction has any breed-specific laws. In the U.S., private property owners are generally free to control what types of objects and people may come onto their property. Therefore, private property owners are free to institute breed-discriminatory policies, including breed bans and restrictions. Breed-discriminatory policies are not BSL. Owners of private properties, such as apartment buildings and pet stores, are not government entities and therefore cannot pass laws, including breed-specific legislation (BSL). But some state laws prohibit BSL. How can an apartment building in those states restrict certain breeds? State laws prohibiting BSL only apply to local governments. Private property is not a government.